A home inspection is a professional, objective, visual examination of the general condition of a home. Home buyers now entering the marketplace view inspections as a way to gain valuable information about the biggest purchase of their lifetime. It helps them to determine whether there are any major defects or system inadequacies at the time of purchase. In most cases, home inspections are performed after a sales contract, conditional upon a satisfactory home inspection, has been accepted by the seller. The inspection can usually be arranged immediately to within a few days. The home buyer is typically encouraged to attend the inspection, so that he/she can see first hand the workings of the home. It also represents an excellent opportunity for the prospective buyer to ask questions about the home or to discuss potential changes. 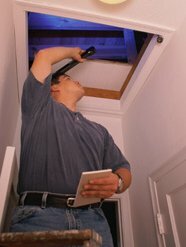 Home inspections should also highlight the positive aspects of a home. In fact, many of the home inspector's observations or recommendations help to dispel home purchaser anxieties, and provide useful repair suggestions. The home inspector's service to the purchaser is primarily one of education. The goal of the inspector is to provide the purchaser with a better understanding of the physical condition of the home in order that they can make a well-informed decision. It is also the inspector's role to keep his findings in perspective for the buyer. After the inspection is completed, a written report should be prepared for the home buyer, documenting the results of the inspection, along with an estimation of repair time frames and costs (found in the "Remarks" section of the report). The home inspection should not be confused with an appraisal, a municipal code inspection, an environmental audit or a home owner's warranty. A complete home inspection should cover all of the major systems of a house, including structure, exterior, roofing, electrical, heating, cooling, insulation, plumbing and interior. As a minimum, an inspection should meet the Standards of Practice of the American Society of Home Inspectors (ASHI).